Kayakers paddle serenely by the tranquil setting of Old Hay Bay Church on Hay Bay. Originally published in the 2012 Hay Bay Guardian, edited by the Rev. Bill Lamb. The historic view from the top of the extension ladder was superb. Hay Bay stretched languidly to my left, glinting through the shoreline trees, green fields of Loyalist lands rolled away to my right, and inches from my nose was the two-century-old carpentry of pioneer settlers. 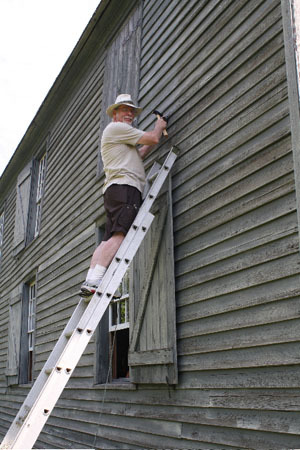 My ladder was propped up against the wall of Old Hay Bay Church, built in 1792, Canada’s oldest extant Methodist Church. As custodian-of-the-week I was about to repair a loosened shutter clasp that was failing to hold the shutter open. I don’t know that I fixed it permanently, but it’s likely good for another 25 or 30 years. That was probably as hard as I worked all week, other than opening the church’s windows in the morning, sweeping up the dead flies and bumblebees, and counting the meager donations left by curious visitors. My wife Sylvia and I had answered a notice in the United Church Observer that sought live-in custodians to greet visitors and monitor the Old Hay Bay Church during the summer. We signed on for the first week of July. 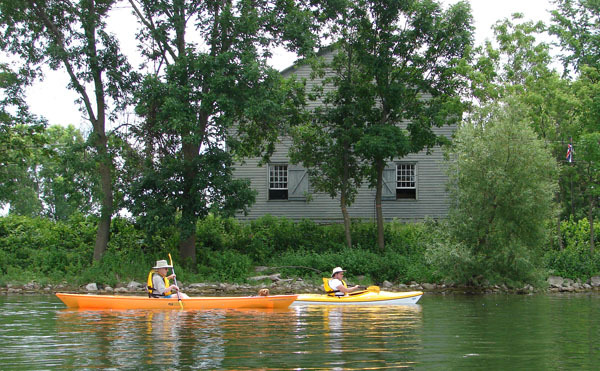 Cottaging is not new to us – we’ve been relaxing by the Rideau at our own summer retreat for more than thirty years. But this was cottaging with an historical spin. The opportunity seemed a perfect marriage of our interests in cottaging and history. We packed up some groceries and our dog Captain and moved to Old Hay Bay for a week. The custodian’s cottage, located at a discreet distance from the church, was built in the 1950s by local construction magnate Harvey J. McFarland who donated it to the church. It is furnished in, shall we say, an eclectic fashion. A relative who had been a preacher’s daughter in the Maritimes said it reminded her of every furnished manse she had ever lived in. But in its own way it was very comfortable and – except for the night we accidentally roasted hundreds of suicidal flying insects in a floor lamp – wrapped us safely and warmly in its familiar embrace. Our duties were not onerous. Open the church by 9 a.m., close about 6, and be around to greet visitors. The visits were sporadic. There might be hours between guests, or you might not have time for lunch. Some were on a mission, having driven great distances specifically to visit Old Hay Bay Church. Others came upon it by accident. You could tell – a car would zip past the church, brake lights would suddenly flash on, then the car would do a U-ey and return to the church. The building has a compelling roadside presence. Part of "greeting visitors” means playing the role of guide and providing information on the building and its history. As we had assisted the Rev. William Lamb, editor of this publication, in publishing a history book on Old Hay Bay Church, we had access to a fount of information. There is also a library in the cottage for further information and consultation. I quickly learned to size up visitors’ interests before launching into my "Full Guide” routine. Some only wanted a quick look inside the building, some had no interest in the church’s religious history but were enthralled by the architecture (immense wide pine floor boards, chiseled wooden beams, impossibly strict Methodist benches), and some were much better informed than me, the would-be Tour Guide. There is always somebody doing research on old Methodist churches and you can learn from them. One man, a minister from the Niagara area, pointed out there are no names on the list of preachers for the years 1812-1814. During the War of 1812, the American Methodist Church was cut off from its Canadian franchises and no names were recorded. Some visitors just loved the serenity of the ancient space. One 30ish mother sat peacefully in a pew while her children played around on the lawn, calling her to come outside. "I love the quiet of old buildings,” she said. "I’m not ready to go out yet.” The church provided sanctuary from her little mob. One evening, as dusk deepened towards darkness, two cars pulled in. The occupants got out and began peering through the windows into the gloom of the interior. I grabbed a flashlight (there are no lights in the building) and gave my first nocturnal tour of the church. The group dropped a substantial gift into the donation box for my trouble. One of our duties was to keep a journal, recording the day’s events and keeping track of any monies brought in through the sales of books or from donations. The journals were a delight to read, since they incorporated the experiences and thoughts of previous custodians. We found the names of friends who had been custodians some years earlier. One journal keeper wrote that she had been visited by "bikers”. We envisioned a gang of burly, bearded and tattooed Harley riders stomping through the church in their biker boots, until a group of benign cyclists showed up. We got the picture. After lock-up, we usually took a drive around the Adolphustown area to poke around old churches, cemeteries and parks. Our dog is very perceptive of routines, and after the second evening he got quite antsy at lock-up if we didn’t get into the car and go somewhere. With the long evenings of early July, we were able to get back in time to enjoy the sunset across Hay Bay and have a late dinner in the cottage. The whole week had the atmosphere of a retreat for us, and we enjoyed it most in the quiet curve of evening. Old Hay Bay Church is Canada's oldest extant Methodist church, built by pioneers in 1792. It is kept open during the summer months by vacationing volunteers who live in a cottage adjacent to the church . What's Hay Bay without a sandwich and a salad? 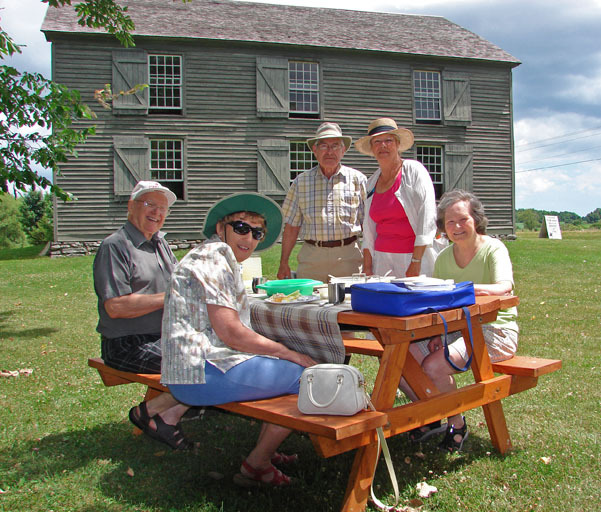 Visitors to Old Hay Bay Church sometimes bring a picnic along. Tables are available on the grounds.